On order this morning, the start of the thread thread says $37.95 shipped but it is $6 something to ship once I checked out, will this cost of shipping be credited back? Sub'd for the same question. So did you get charged for shipping. I apologize about that. I had forgotten to edit the first post, but we are no longer offering free shipping on the kits. If this is an issue, please send me a PM with your order # and I'll get you taken care of. Got the T-Case linkage installed this weekend. Feels AWESOME to have firm shifts again!! I do have one question - the transfer-case arm does just *barely* make contact with the t-case housing when I put it in 2-wd high. 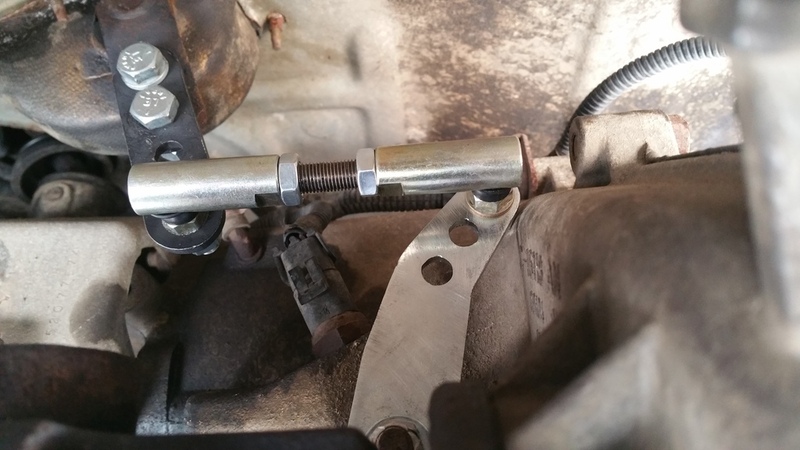 Should I grind some metal off the bracket, or just leave it, as it shifts perfectly into 2wd high (I just dont have the "wiggle" room when pushing the lever all the way forward). My setup is a 4.5 RE Lift kit + 1" T-Case Drop + AX-15 + 231j, on a 98 Cherokee 4.0. I do not have any issues shifting from 4-Hi to 2-Hi, though its only been installed for a day or so. The pic is showing the t-case and shift handle in 2-Hi, and you can see the arm making contact on the right side of the picture. It is firmly in 2-hi in this picture, but I do have 1-2mm of metal I could shave off the t-case arm if you guys think that would be a smart idea. I decided to replace my motor and trans mounts which took care of the above issue! Last edited by investinwaffles; 08-10-2018 at 08:18 AM. Did my install today. I can once again shift through all the gears in the transfer case. I have some fine tuning to do, but its working much better than the old factory setup. Great product! installed today....great product, easy install, solid.. A Must! Just placed my order! Looking forward to adding this when my SYE is installed. Thank you for the orders guys! I just received a batch of flanges back from plating and will begin shipping later tonight. 50+ kits are currently in stock! Thank you all for the business! How difficult is the 231 no tc drop install? It's very easy. Took me about an hour to get it dialed in perfectly.